First I have a process video so you can see how this layout was created from start-to-finish! I started by fussing cutting over 3/4 of the flowers and leaves from Pick-Me-Up Paper 23. It took a few hours, I'll be honest. But I got all caught up on my Netflix and Hulu shows! I didn't even have a plan for all the pieces, I just knew I liked the colors and how tiny the images were. When I was about halfway through fussy cutting and needing to figure out the next steps, I went through all my Silhouette cut files to see if there was anything that struck my fancy, floral themed of course! I came across my Flower Wreath cut file and thought it might be fun to put all of the tiny flower and leaf shapes I've cut out on top to create lots of texture. And so the idea was born! I grabbed the first color of cardstock I could think of that would match and didn't even audition any other colors - usually I feel like I spend most of my time on a layout just picking the background! But this yellow was so bright and cheery and brought out the yellow flowers so I went with it. I started placing the fussy cut flowers on the die cut flowers, the fussy cut leaves on the die cut leaves, and liked how it looked. Before I glued anything down I did some mixed media on the background. I scraped white acrylic paint in the shape of the wreath and splashed matching watercolors on top followed by a layer of white acrylic paint splashes. Once the background dried I glued all of the flowers and leaves in place and let the edges bend up for lots of dimension. I didn't have any photos to match, so what's a girl to do? I put my daughter Jane in a white lace shirt and took some photos! Now I had the perfect pics to scrap! Please tell me I'm not the only one who has done this?! Hahaha! To finish I created a title with Pick-Me-Up Chipboard Thickers, Ephemera Die Cuts, and Stickers. I wrote journaling on a Chipboard Sticker and tucked it into the wreath. 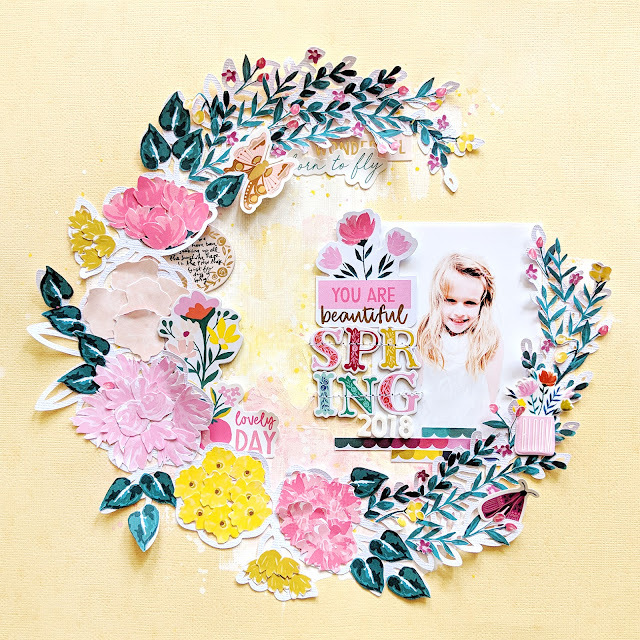 I hope you are inspired in some way by this layout, whether it's fussy cutting, layering die cuts, or creating a wreath shape! Thank you so much for stopping by today! Sooooooooo gorgeous! LOVING that adorable photo (her hair is getting SO LONG!!!) and love love love love that wreath!!!! Just WOW!!! !